Would you like the fun of designing and making your own doll clothes without having to sew? My printable doll clothes are PDF files that can be printed onto regular printer paper, cut out, folded, fitted on the doll and taped together to create many fabulous outfits that fit most fashion dolls such as Barbie, Monster High, Ever After High, and many more. 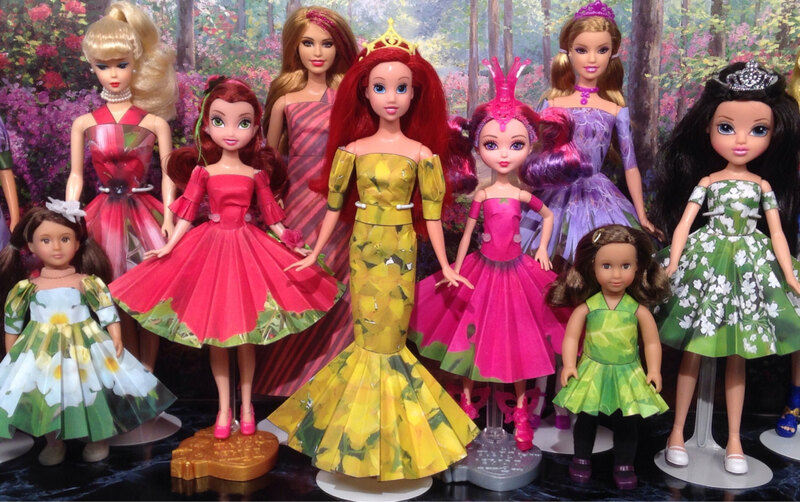 In the picture above are 19 different sizes of dolls but with a little adaption to fit the largest and smallest of the dolls, they all can wear dresses made from my outfit sets. Each outfit set comes with mix and match tops, skirts, sleeves, and accessores which can be combined to create many different outfits. My outfit sets are available at my Etsy store. In addition to single outfit collections I am currently offering volume sets and a Mega Pack that includes everything in the store. Here are some quotes from my Etsy reviews. Check out the “The Dresses” sections for more pictures of my outfits, which pieces I used to make them, and links to the dolls who are modeling my outfits. In addition to the color versions, each of my outfit sets comes with an ink saving template version that uses only black ink to print. After printing the template it can be colored with crayons etc for a unique look. In the above picture the dress on the right is the basic uncolored template. The dress on the left and the dress one from the right are templates that have been colored with crayons. The dress one from the left is a regular color ink printed dress. 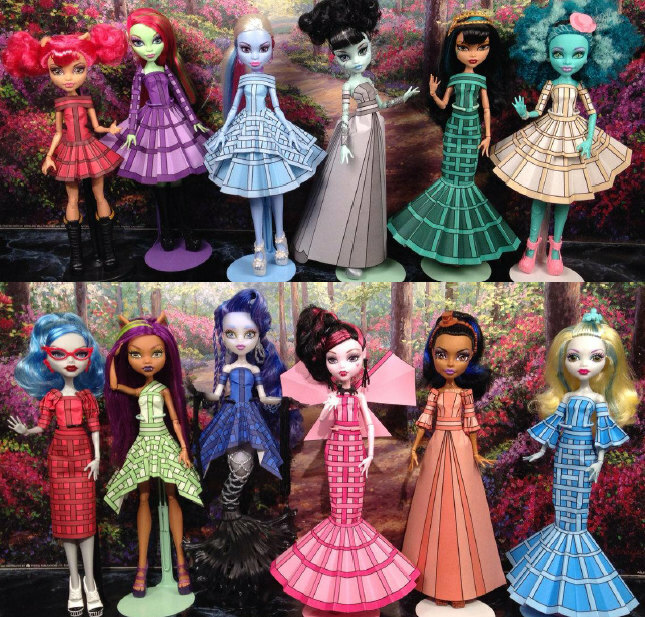 Here is a starter tutorial video showing how to make several outfit combinations for Monster High dolls. 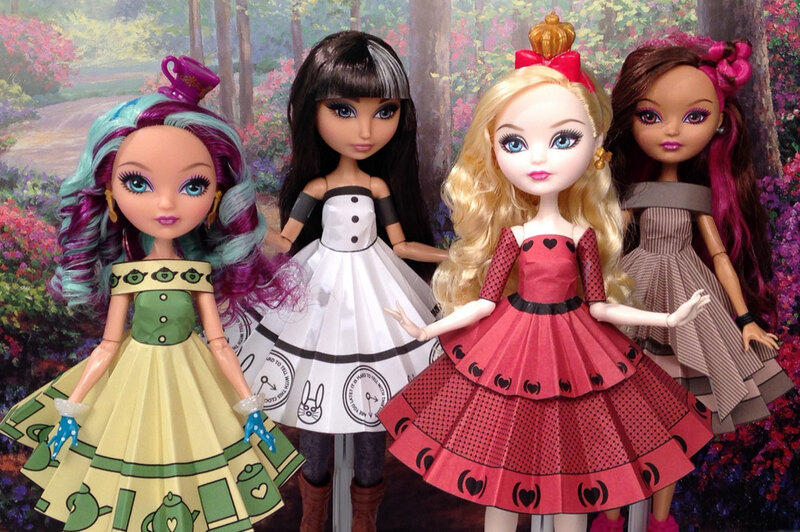 This tutorial also works for Ever After High dolls. Here is a starter tutorial video showing how to make several outfit combinations for Barbie dolls. 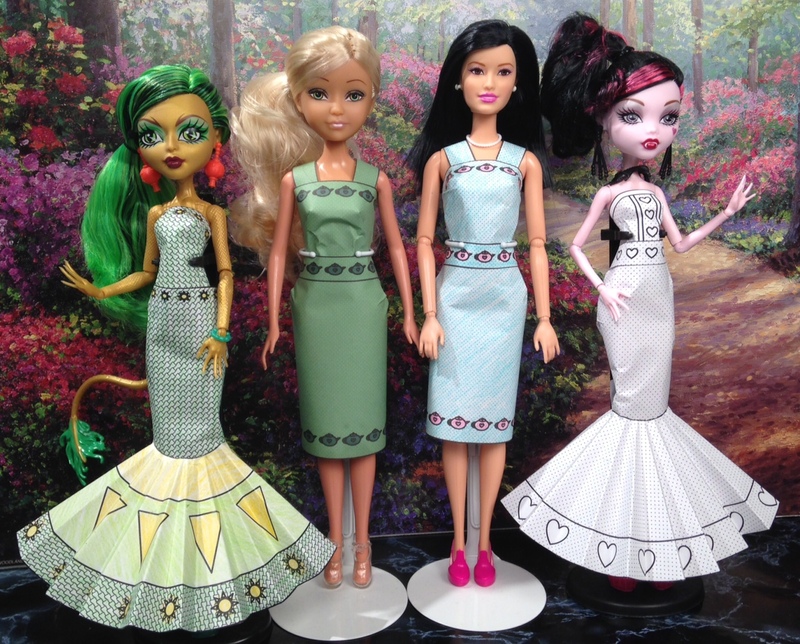 If you’d like to try out paper dresses for your dolls, the dresses in the above picture are available as a free download. These are amazing! So unique and creative! THERE THAT GORGEOUS! It’s INCREDIBLE AND CREATIVE WITH CERTAINTY! Any adjustment to doll size? ANY geito I LOVED, is SMART! Would it be too much to ask for a free straight skirt prinable and long sleeves printable? I LOVE your free printables my dolls now have a complete wardrobe!!!! !😁 I’m thinking about buying some fashion sets from your store! That’s so cool. But can you do it on AG dolls because I have 2 dolls but only 6 outfits?